A medium evergreen shrub that flowers in Spring, Summer and Autumn. 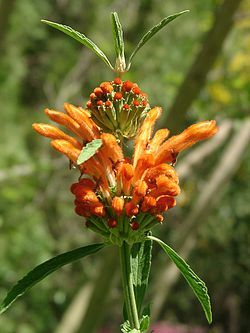 Leonotis leonaros has long been used in African traditional medicine. It has been used internally for fevers, headaches, dysentery, flu, chest infections, epilepsy, constipation, intestinal worms, spider bites, scorpion stings, hypertension and snakebites. Externally it has been used for hemorrhoids, eczema, skin rashes and boils. We can't recommend it for anything but a nice addition to your garden! Full sun to part shade. Frost tolerant and drought hardy. Height 2m. Width 1 - 2m.